Why don't miners get boiled to death at $4$ km deep? The Mponeng Gold Mine is nearly $4$ km deep. It has the largest elevators in the world and is considered one of the most dangerous mines in the world. The geothermal gradient is $25$ degrees Celsius per kilometer, which would be $100$ degrees. 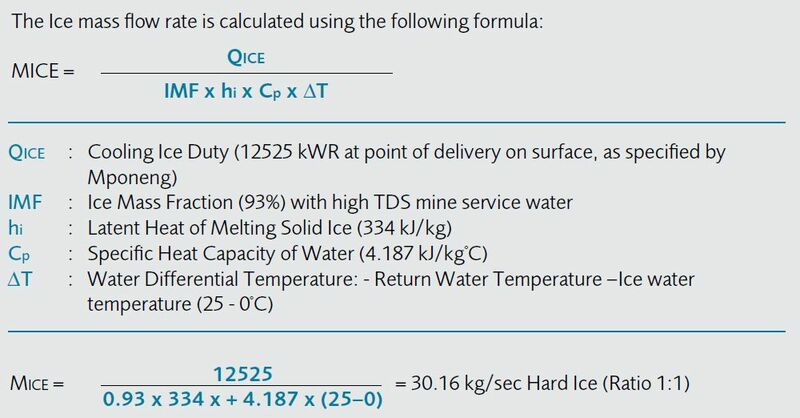 Therefore, it would be well over boiling temperature at the deepest part of the mine, at least theoretically. Why don't the miners get boiled to death? Also, I have read that the temperature in the mine is only $150$ °F [$66$ °C] which would seem to conflict with the geothermal gradient. Why is that? As noted in CountTo10's answer, the main answer is simple - miners don't "boil" because the mines use suitable cooling and ventilation equipment, plain and simple. That said, there is a contradiction, at least if you go only by Wikipedia and explicitly ignore its caveats. The Wikipedia page for the Mponeng gold mine makes the maximum rock temperature at 66 °C, and if all you read from the Wikipedia page on the geothermal gradient is the stuff in bold, then yes, a 25 °C/km gradient over a 4 km depth would give you 100 °C on top of the surface temperature. Away from tectonic plate boundaries, it is about 25 °C per km of depth (1 °F per 70 feet of depth) near the surface in most of the world. (Taken from S. Afr. J. Sci. 110 no. 3-4, p. 1 (2014).) 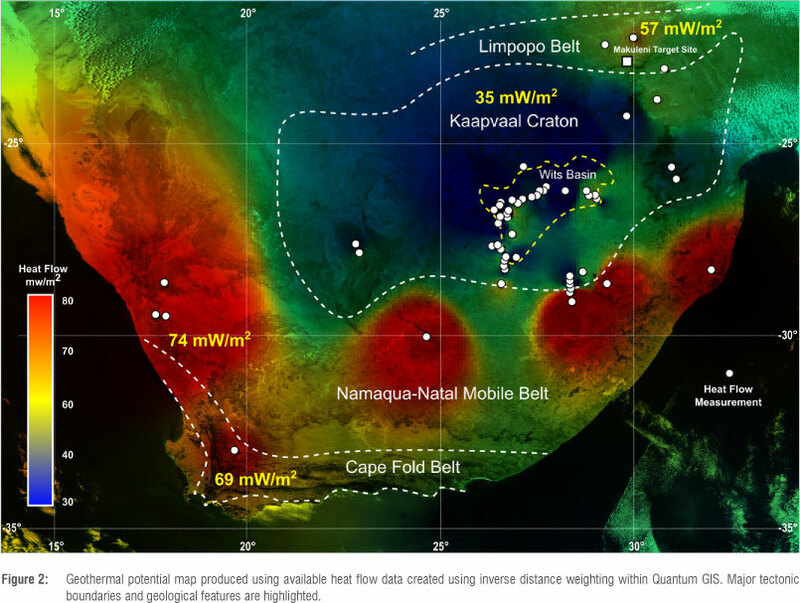 This makes it clear that the Mponeng mine is right on top of a cold spot in the Wits basin. 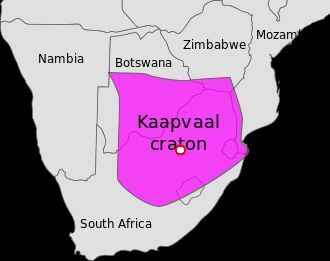 mining at these depths is only feasible in South Africa’s Wits Basin due to a relatively low geothermal gradient (nine degrees Celcius/km) and the presence of gold reefs in hard competent country rocks. This is enough of an agreement to call it a day. Backtracking a 9 °C/km gradient over 4 km gives a ~36 °C difference, and taking that away from the 66 °C (maximal!) rock temperature in the mine gives a ~30 °C average surface temperature. This is relatively high, but it is within a reasonable envelope, and there's plenty of leeway on the numbers (e.g. making the gradient 10 or 11 °C/km) to take away any glaring contradictions. There is this very short account on Wikipedia, which seems to cover it. The temperature of the rock reaches 66 °C (151 °F), and the mine pumps slurry ice underground to cool the tunnel air below 30 °C (86 °F). A mixture of concrete, water, and rock is packed into excavated areas, which further acts as an insulator. Tunnel walls are secured by flexible shotcrete reinforced with steel fibers, which is further held in place by diamond-mesh netting. The gradient you're quoting is an approximate figure that applies to most places. There could be local variations, both in terms of where on the globe the mine is and in terms of the gradient not being exactly constant with depth. It's not so surprising that this one mine is off prediction at a depth of 1 km, which is only about 1% of the lithosphere. One might speculate that having an air pocket (the mine) would passively affect the temperature of the local rock as well before the active cooling system is considered. Geothermal gradient is the rate of increasing temperature with respect to increasing depth in the Earth's interior. Away from tectonic plate boundaries, it is about 25 °C per km of depth (1 °F per 70 feet of depth) near the surface in most of the world. After the ice melts, the melt water at temperature 25C is pumped back to the surface. According to Howden, the company that provides the technology to cool the mine, the virgin rock temperature at the bottom of the mine is 55C and the ambient air must be maintained at a temperature of 28C or lower. It is important to realize that virgin rock temperatures are only one source of heat. Mining machinery engines, lighting systems and auto-compression of air all add more heat. Auto compression is the term used to describe the way air is compressed by its own weight as it descends into the mine. The heat flow into the mine is mitigated by using thick concrete-based insulation that provides a thermal barrier to the virgin rock. 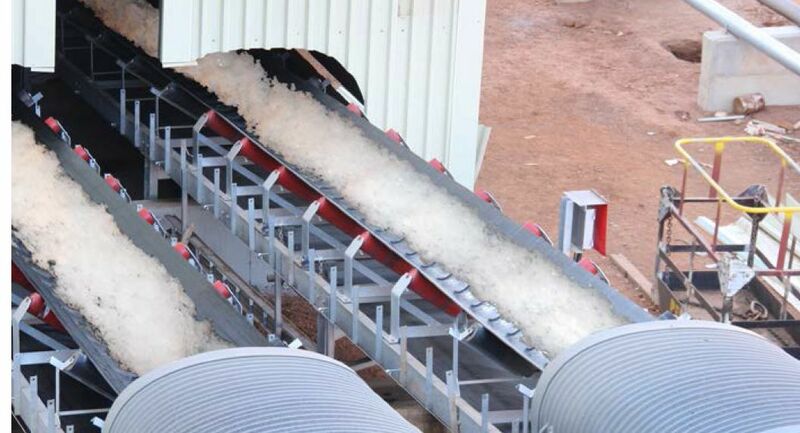 The mine is lined with this insulation, reducing the amount of cooling ice needed. The reason why the virgin rock temperature of the mine at the deepest levels is only about 55C as opposed to the 125C we might expect is that the geothermal gradient can differ substantially depending on the kind of rocks in the local area. Different rocks have different heat capacities and insulating qualities, therefore, the thermal flux at different depths and geographic locations will be quite different. Also, tectonic effects like volcanism can increase the heat flux. In addition to this, some rocks, like granites, actually generate heat, so that can affect the heat flux, as well. Yet another factor is the orientation of the country rock. For example, quartz is highly anisotropic so the heat flow through it depends significantly on the direction the quartz crystals are oriented. The mine is located at the white dot. As you can see it is located right above the center of the craton. Not the answer you're looking for? 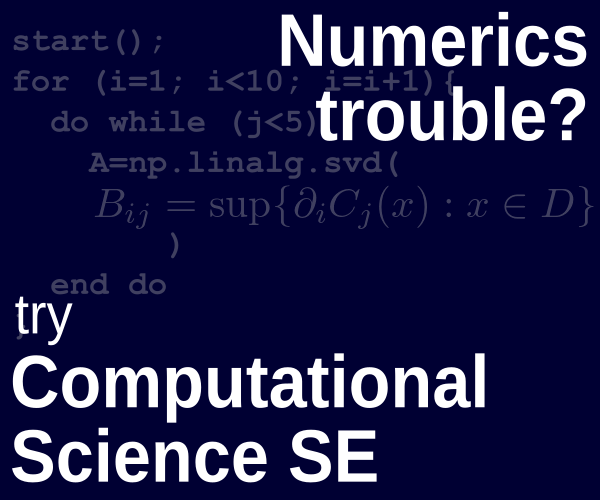 Browse other questions tagged temperature geophysics or ask your own question. How hot can plasma get? Why heavy elements don't sink to the core? Why don't objects radiate off all of their heat energy? Why don't solstices coincide with temperature extremes? How is temperature defined, and measured?